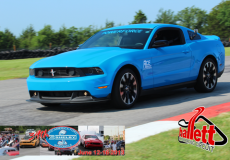 We have had a successful 2012 season from ShelbyFest in Hermann, Missouri to the Ford and Shelby Nationals in Tulsa, Oklahoma, to Mustang Week in Myrtle Beach, South Carolina! We have drag raced at the NMRA nationals, run the road course at Hallett Motorsports Park, and autocrossed in many locations. Ace Racing Clutches had a great tour this year being part of the Mobile Mod Center. Teaming up with the likes of MRT (Mustang Racing Technologies) from Plymouth, Michigan, Gateway Classic Mustangs from Bourbon, Missouri, and other great companies like Kicker Audio, Mustang Club of America and many more. We have met many great people and have showcased what our company can do with clutch technology and our priority in providing customers with a top of the line product. We have reached all spectrums of driving and racing from track day events and 4 wheel expos. Gearheads from all around the country have help spread the word that Ace Racing Clutches provides great products and great customer service. We want to thank all of the people who have talked with us and shared their stories. We look forward to helping people in the future with their clutch needs and can’t wait for the next years to come!